In “The Place of Theosis in Orthodox Theology,” Andrew Louth describes Eastern Orthodoxy as focused on a “greater arch, leading from creation to deification” and feels that Catholic and Protestant theologies have focused on a partial “lesser arch, from Fall to redemption” to the exclusion of that whole (in Christensen and Wittung, Partakers of the Divine Nature, 35). This observation fits so well with my recent studies concerning salvation vs. exaltation and how these to doctrines are viewed in LDS theology and ‘traditional’ Christianity. The “sinner’s prayer” is promoted heavily in modern Christianity. The point is to bring people to Jesus and they do it the best way they know how. “Have you been saved?” What a powerful question to ask, and what feelings of gratitude or fear it raises in the hearts of men. The narrow scope of this approach seeks to take you from where you are now, a fallen, sinful soul, to the arms of grace that are waiting to receive you. Now there are obvious doctrinal differences to the actual process of being born of God, but both modern Christian and Latter-day Saint theology seek the same ends: a remission of sins, grace to satisfy the demands of justice (Alma 34:16). 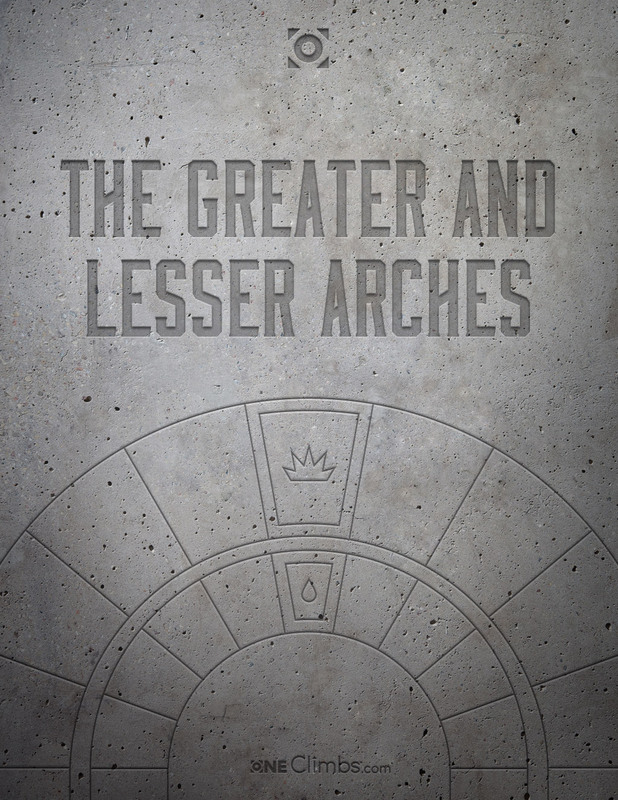 The core of Latter-day Saint theology is established upon this “lesser arch,” but in addition, recognizes the “greater arch” that spans the beginning of creation all the way to deification or “exaltation.” But before we pick at the mote in the eye of those who would reject the greater arch, let’s take a long look in the mirror first. Are some of us so caught up in the pursuit of the greater arch in our own lives and in the lives of those around us that we neglect the lesser arch? Have you been born of God, good Latter-day Saint? Do you mock the “sinner’s prayer” only to assume similarly that simply participating in ordinances has purchased your ticket to salvation? Can you say with Enos and Alma the Younger that you have been born of God? Do you even know what that means? There is no exaltation without salvation. An ordinance in and of itself guarantees you nothing, you must press forward with a steadfastness in Christ (2 Nephi 31:20), you must come unto Christ and be perfected in him (Moroni 10:32) because there is no other way (Alma 38:9). Have you had your wrestle with God to obtain your remission of sins (Enos 1:2-5)? So, Latter-day Saints, have you been spiritually born of God? Do you know what those words mean and can you confidently answer in the affirmative or is there doubt in your mind? If you have felt to sing the song of redeeming love, can you feel so now at this time? And after they had been received unto baptism, and were wrought upon and cleansed by the power of the Holy Ghost, they were numbered among the people of the church of Christ; and their names were taken, that they might be remembered and nourished by the good word of God, to keep them in the right way, to keep them continually watchful unto prayer, relying alone upon the merits of Christ, who was the author and the finisher of their faith. And the church did meet together oft, to fast and to pray, and to speak one with another concerning the welfare of their souls. Can we build the arch of exaltation upon an unfinished arch of salvation? Once the lesser arch is firmly fixed in our lives, once Christ and his redemption is at the keystone of that arch, then we may build upon it the arch of exaltation, with patience, pure charity, and an eye single to the glory of God; anything less is a foundation of sand. To learn more about the greater arch, I highly recommend the Church’s recent article Becoming Like God and the Holy Scriptures. If there is any doubt in your mind, you may want to search Alma chapter 5. How do you understand the doctrines of salvation vs. exaltation? How do you teach salvation to your children? How do you feel that we do as members of the church at maintaining the balance between the two arches? Salvation: Where does one begin? Thank you for this post. This is a timely message, and just like Elder Bednar talks about the difference between testimony and conversion, (https://www.lds.org/general-conference/2012/10/converted-unto-the-lord?lang=eng), we need to talk more in the church about the difference between the Gospel of Salvation, and the Gospel of Exaltation. I’m sure this connection is an obvious one, but I love how the arches symbolically represent the Priesthood and the Priesthood Keys. Just like the “lesser arch” represents from fall to redemption, the Lesser or Aaronic Priesthood holds the keys to the Gospel of Salvation. And just like the “greater arch” represents from creation to deification, the greater or Melchizedek Priesthood holds the keys to the Gospel of Exaltation. Sometimes I hear people put too much focus on the higher ordinances of the Gospel. Although the ordinances administered by the Melchizedek Priesthood are important and necessary for exaltation, so are the ordinances of the Aaronic Priesthood! You cannot have exaltation without salvation, which is exactly what you are saying here. I’d also like to add one thing: Tevya Washburn, in his blog, “Sacred Symbolic,” wrote a two part article on how our modern day meeting houses are like temples of the Aaronic Priesthood. The ordinances of the Aaronic Priesthood are administered therein, (baptism, sacrament, teaching, others…), and the purpose of these ordinances are to bring us to Salvation through the atonement of Jesus Christ. In the same article he says that in the “higher” Temple we learn the higher ordinances of the Melchizedek Priesthood, (or the Gospel of Exaltation, or the “greater arch.”) He said something that might seem plain but for some reason really stuck out to me, and continues to stick out to me: that one of the purposes of going to the Temple is so we can learn through the “higher ordinances” how to live the “lesser ordinances” better. In other words, we need to go to the temple because through learning to live the Gospel of Exaltation, we do better at Gospel of Salvation stuff – like repenting, forgiving, serving, etc… And I love how you mention that an ordinance by itself means nothing! It is an invitation to live by a certain principle. Lastly, I really believe that the main purpose of the Book of Mormon is the Gospel of Salvation. So reading this book every day is about the best thing we can do to “Come unto Christ and be perfected in Him.” The Book of Mormon is indeed the keystone to our religion, and I believe it is the keystone that holds the “lesser arch” together. I wanted to make a note about one of the last things I said. I said that “reading (the Book of Mormon) is about the best thing we can do to ‘Come unto Christ’ and be perfected in Him. '” What I meant to add is that reading the Book of Mormon, while important, is not enough in and of itself. We must be LIVING the principles of salvation. Reading, praying, pondering, studying, and meditating on principles are all very important parts of coming unto Christ, but we need to be living the principles as well. As we live the principles, our testimonies grow, we become converted by and by, and when we are converted to Christ, as was Peter, we need to strengthen our brethren.